The SciFi Deluxe Plugin must be installed to your CoolEdit root directory. Run the install program and when prompted, select the root CoolEdit directory on your PC. When installation is done, you can run CoolEdit. Open up a sound file of your choice. Then go under the "Transform" menu. Near the bottom should be the "SciFi Effects..." entry. Click on it and it will bring up the SciFi plugin dialog box. If the plugin does not show up in the CoolEdit Transform menu, you can check to see if the file was placed in the proper directory. Go to your CoolEdit directory and look for the file named "scifi.xfm". If it exists, the install was successful. If not, you may have installed it to a different directory. Search for the file. The plugin writes initial values to your registry. If they were not found, the plugin will reinitialize them, which is not an error! This is normal. The plugin has 4 tabs, one for each scifi effect. The dialog box will come up and look similar to this. Note that if you are not a registered user, a nag dialog box will show each time you invoke the plugin. To get rid of the nag screen, please register your plugin. Your registration supports us and allows us to make updates and new releases of the plugin. User Note: These effects were optimized to work on voice signals using a sampling rate of 11kHz to 22 kHz. Of course, the plugin will work over all legitimate sampling rates in CoolEdit, but since voice only requires a sampling rate in this range, the plugin will sound best when using these sampling rates. Feel free to experiment though! The mix controls are located at the bottom of the plugin dialog box. These are seen in each effect's dialog box and perform the same function within each effect. They control the amount of mix applied to the sound or voice signal. Determines the percentage of the applied effect that appears in the output. A wet mix of 100% results in the output consisting entirely of the applied effect. Determines the percentage of the original sound or voice that appears in the output. A dry mix of 100% results in the output consisting of the original signal untouched by the applied effect. When enabled, constrains the wet mix plus dry mix to equal 100%. When disabled, you can set the wet and dry mix to arbitrary values, but clipping in the output signal can occur. Linking the two mix values allows you to mix the original voice in with the modified voice, allowing one to emulate different masking voice effects while keeping a percentage of the original voice intact. Presets store off commonly used parameters so you do not have to remember all the values to create any given voice effect. Included with the plugin are some presets that create some common voice effects. You can tweak the parameters or come up with your own effects and then save these presets using the Save Preset button. Name the preset something meaningful that corresponds to your effect. You can delete previously stored presets using the Delete Preset button. However, you can not delete the default presets that are included with the plugin, they are not removable. 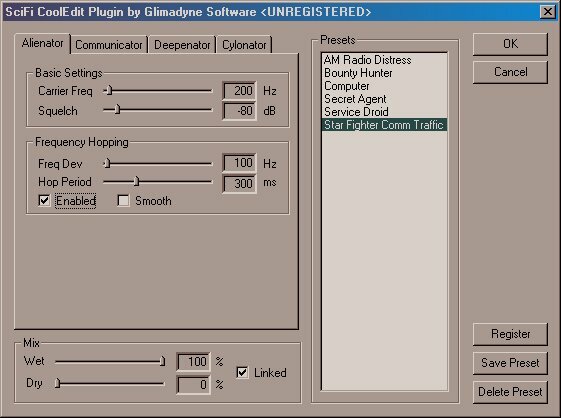 Once you have registered your plugin, click on the Register button, and enter the info that you received from GlimaDyne Software. This removes all restrictions from the plugin and removes the nag screen. At this point, you can access the help page for each effect and start making cool voices and sounds. Have fun!